Brothers On Life™ is a journey into the mind and soul told through personal reflections, childhood photographs, and the stories of two brothers, actor Matt Czuchry (“The Good Wife” & “Gilmore Girls”) and psychology professor Dr. Mike Czuchry. Told in three acts, these pages of youth, death, philosophy, spirituality, and love are used to tap into the universal connectedness we all share when experiencing the complexities of our individual lives. Each piece is what you need. Each piece is what you see. All in an effort to unlock the dreams and imagination of that child within. What will you uncover about your own life when tapping into the essence of the collective? Never has words spoke to me like in this book. It made me feel warm, happy and made me reevaluate. Celebrate spoke to me....hope came to mind. Katie (me) has a new focus....life is going to be living, loving, laughing, coffee and faith. 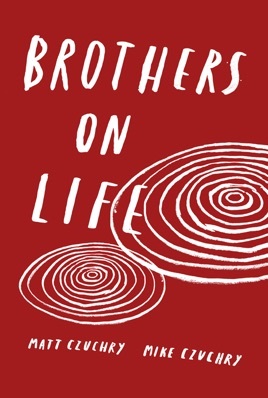 "Brothers on life" by Matt czuchry and mike czuchry is such a great book! I read it in one day! Can't wait until I can give my nephew this book to read when he gets older. As a struggling artist, I'm elated to find comfort, courage and love in your words. Thank you for writing these stories. Definitely recommending this book to all of my friends.